I'm starting a new series on my blog for a round-up of sorts on Fridays and I thought I'd start it off with my March Restuarant Round-Up! I'll be showcasing photos of all (or at least most) of restaurants I've had the pleasure of trying out or some old favorities. These won't be full reviews (unless requested or if I have enough photos!) but I may end up writing one to accompany it later or link it to my Yelp! I hope you guys enjoy these! Anything marked with (*) indicates my first time trying the place! Ham & sausage tofu soup with all the banchan! Bacon, eggs, and hashbrowns w/ a side of grits. And a Belgian waffle with fruit! Combination pho with a lychee Jazen tea! Crispy Rice with grilled beef and egg (my favorite) and duck noodles. Hawaiian style tuna poke with cucumber kimchi. Kanro dipping ramen and Spicy Miso ramen. Maple butter, walnut, honey crumpet and a pesto tomato one! The biggest and best fried catfish ever with all the veggies and wraps! Lemongrass soda, Hue dumplings, Bun bo hue, and duck noodles! Lamb gyro and waffle fries. Thai Tea shaved ice with mochi, lychee jelly, and mango popping boba. Ginger Martini, Vanilla Moscow Mule, Muscles and Camapnelle Pasta Saltimboca. Chopped salad, imperial rolls, grilled shrimp vermicelli bowls and Saigon style pho. Don Juan roll, bad boy roll and mirugai (geoduck) and uni (sea urchin)! Giant Bloody Mary and Cinnamon brioche french toast. Flatiron steak, a fried egg and corn over hot sizzling rice. Sparkling Rose, Blood Orange Martini, oysters and scallops on the half shell, soft shell crab tempura, paella, uni pasta, ahi poke, apple pie w/ salted caramel ice cream, and prickly pear and blood orange sorbet! 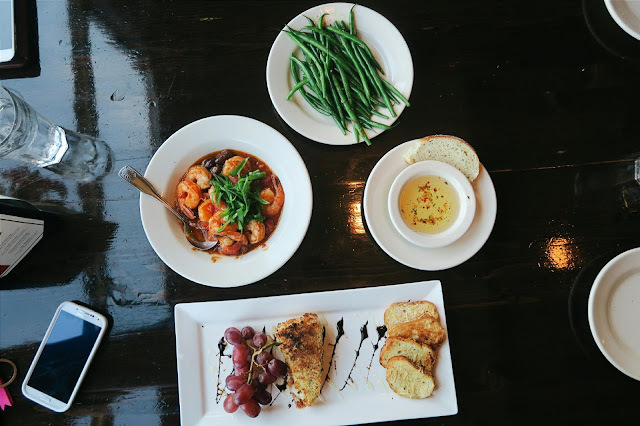 Sauteed shrimp and green beans, and baked brie with macadamia nuts and some grapes.